Want to wow your neighbors this Easter Holiday? 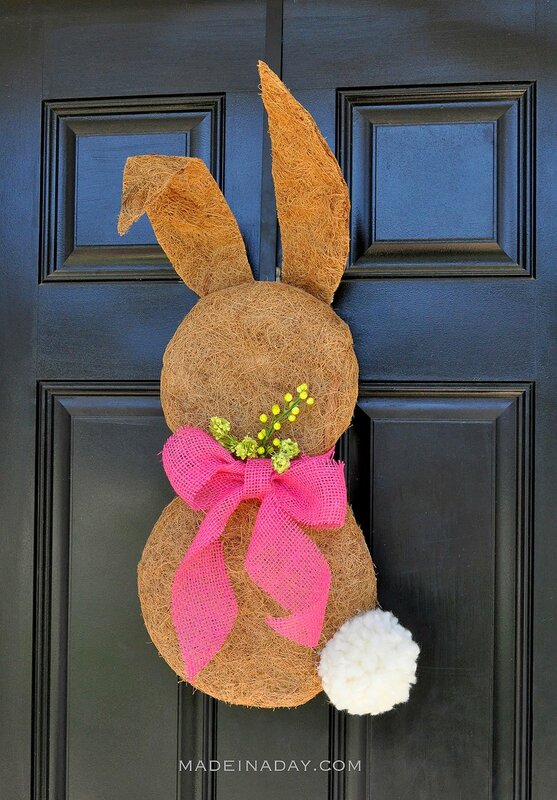 Try making my Sweet Bunny Wreath Made with Coconut Liners for your front door! For more fabulous ideas see my Easter + Spring page. Spring is here and Easter is on it’s way! Is your home decorated for spring yet? This time of year I see moss covered crafts are popular for spring decorating. I was on the hunt to make something with moss for my front door for Easter. 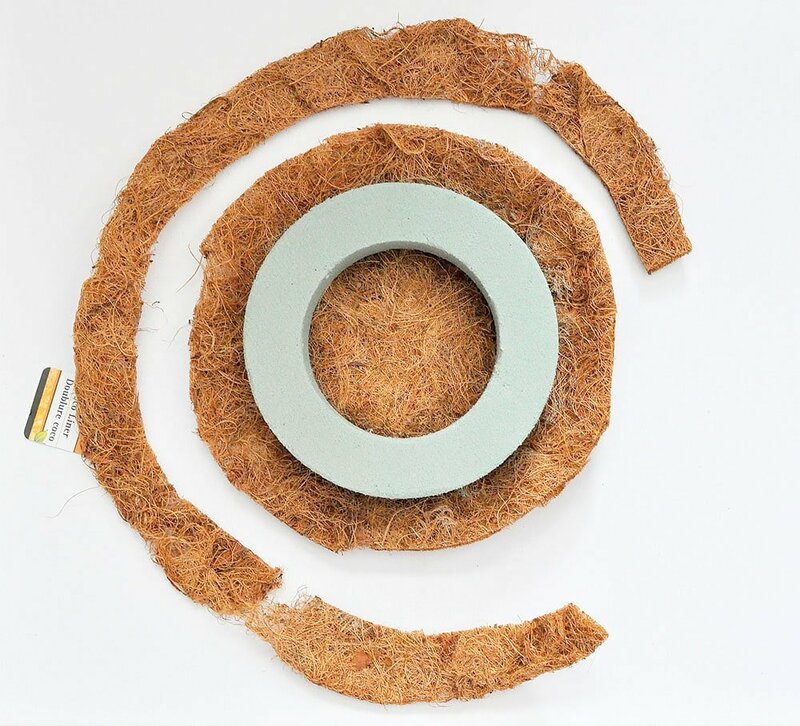 I was scoping out the spring section of Dollar Tree store when I spotted this coconut liner in the spring plant section. 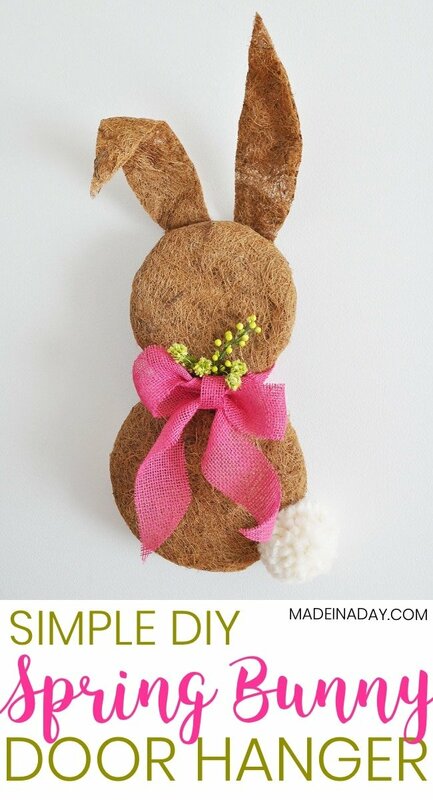 I instantly thought what a great alternative to moss and what a perfect color for a natural looking bunny craft. It turned out to be the perfect material for a spring door hanger. 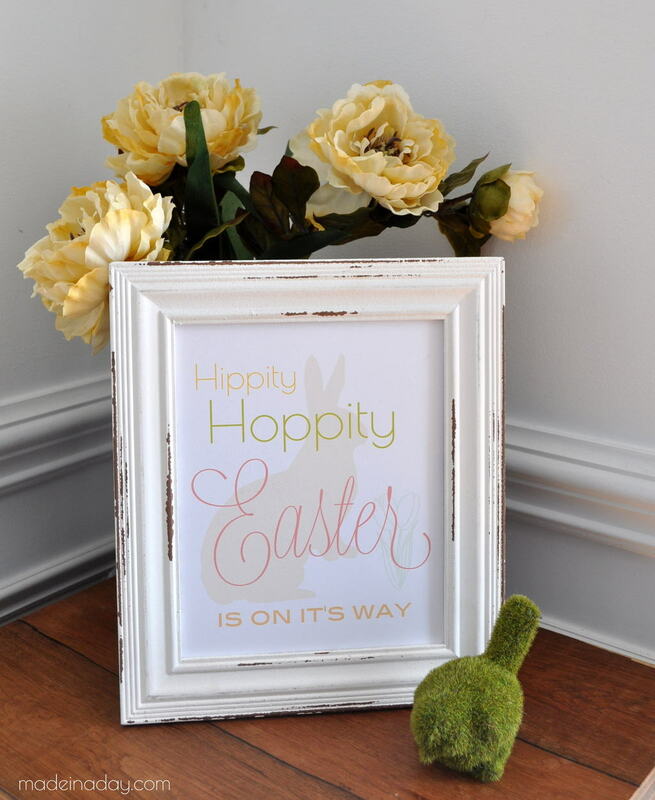 Here is how I made this easy Easter bunny wreath. 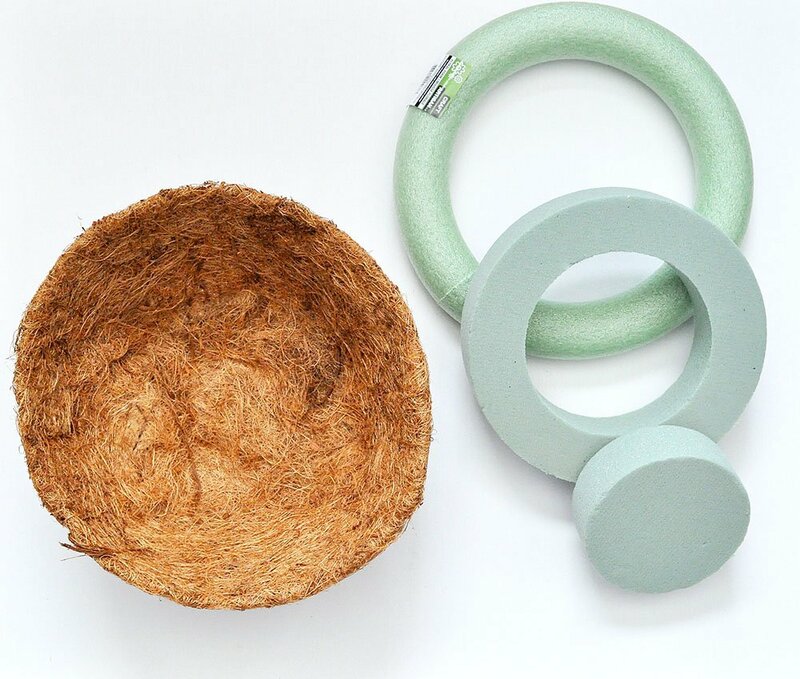 Small foam circle shown above not used. Gently pull and stretch the molded coco liner to make it lay as flat as possible. Place one of your wreaths in the center of the liner and trim the liner to fit over the edges for the size of your wreath. 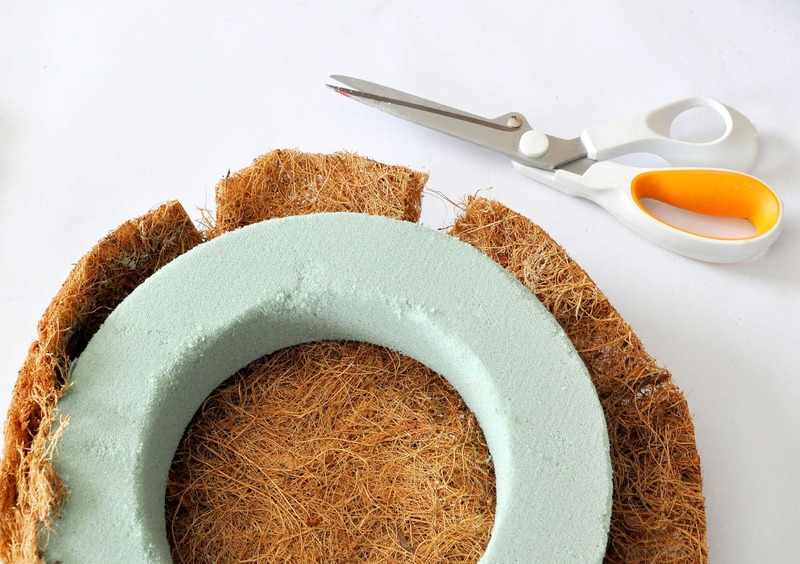 Cut triangle slits out of the liner every 4 inches going around the outside of the foam wreath. Hot glue the liner to the wreath. Glue slowly around the wreath allowing the glue to thoroughly dry before going on to the next section. I used straight pins to hold the liner in place and snug to the foam while the glue dried. Repeat with the other wreath. Glue the two wreaths together and to stabilize them, place two skewers or toothpicks pushed through both wreaths. Add glue to the picks and between the liners. Let it dry. Pull and stretch the third coco liner out flat. Cut the liner in half with sharp scissors. Take one-half of the liner, leaving the straight cut side alone and cut a rounded outer ear side out of the liner. Using this ear as a guide, lay it on top of the other half of the liner and cut an exact copy of the ear out. Trim the rears down to suit your wreath size. Hot glue them to the back and top of the smaller wreath. Add a strip of pink burlap ribbon and tie in a bow. Add a few spring picks and hot glue them to the back of the bow. 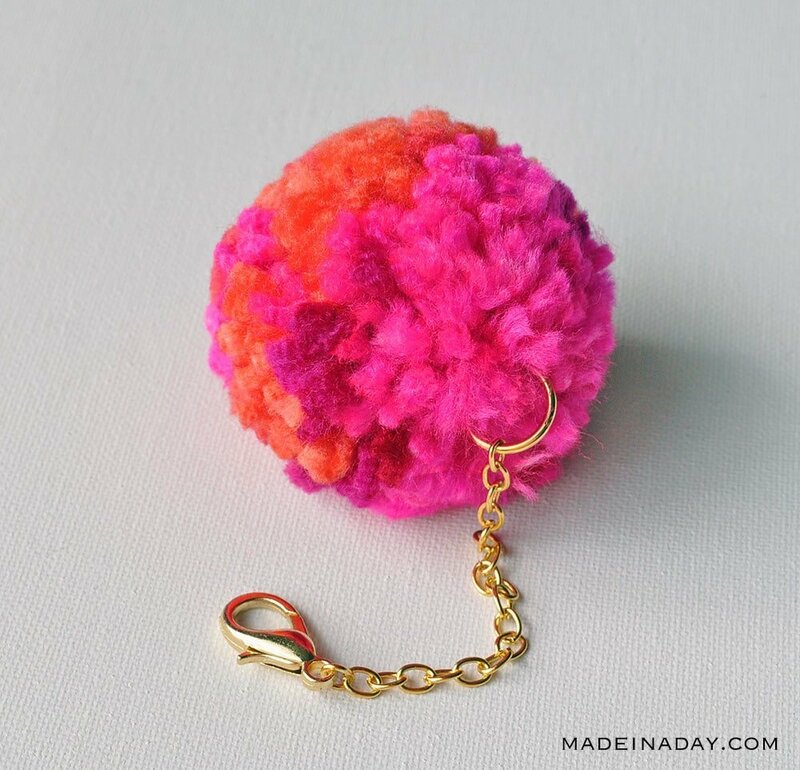 Now you can easily buy a pom pom for the tail or simply leave it off. I wanted a big fluffy tail, so I used my Jumbo Clover 4.5 inch Pom Maker to make one. 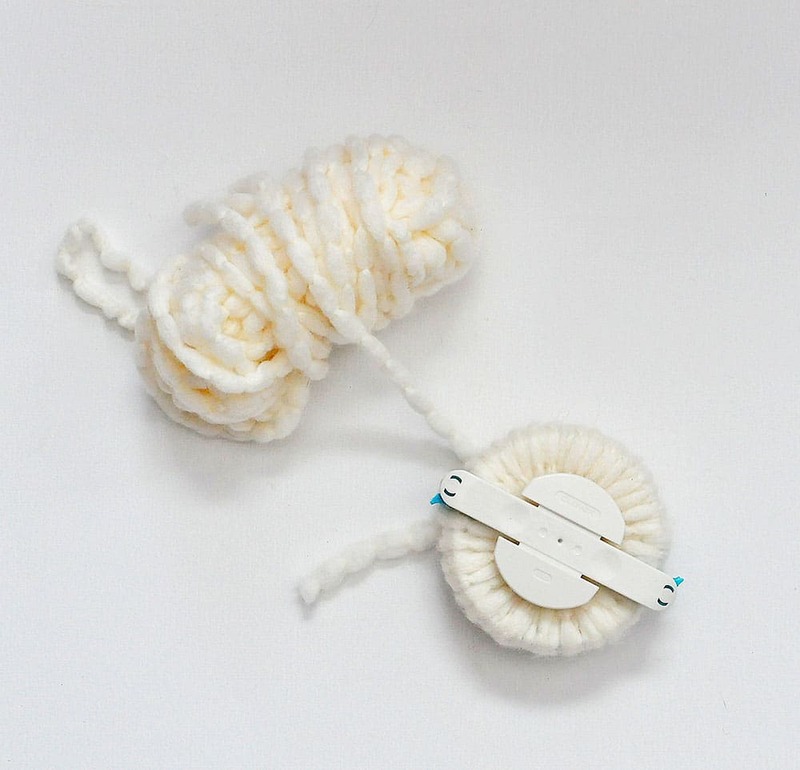 NOTE: See my detailed instructions on how to use the Clover Pom Pom Maker post. Hot glue the tail on the bottom of the large wreath. Add a hanger on the back by gluing a small piece of twine or yarn between the ears and that’s it! He’s so fun and I really liked working with the coco liner. It is so easy to mold and stretches into and around objects. I am totally going to use it from now on as an alternative to moss. What would you cover with coco liner? I’d love to know what your ideas would be! Where did you find these size styrofoam wreaths? I’m so disappointed. I bought very everything I need but can’t find the wreaths anywhere. I got the large green one and the other foam green smaller wreath is a dry foam wreath, that I got at the dollar store. I provided a link in the supply list for the 7.8 wreath and I added one for the other wreath. A 10-inch wreath will work instead of 9.8 inch. That is so cute! I love how natural it looks too. What a fantastic idea. Pinned. OMG, I love this idea. Your bunny is so adorable. Hope you stop by Over The Moon tonight since you are being featured. Thanks so much Beverly! Glad you liked my bunny! Love this! 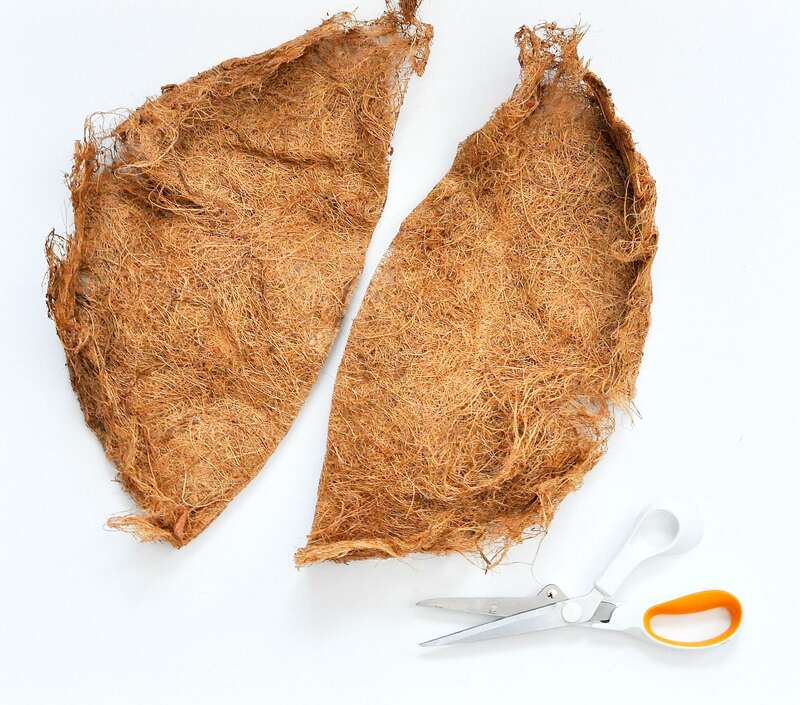 Great idea to use plant liners. Visiting from Merry Monday party. Oh glad you liked him, he’s my new fav. Thanks for stopping by. Kim, I can’t believe these are plant liners! What a clever idea! And your bunny wreath is so, so cute! Wow I never would have thought about using those liners to make a wreath. Great idea and I love how it turned out!! I see the florist in you with this craft. 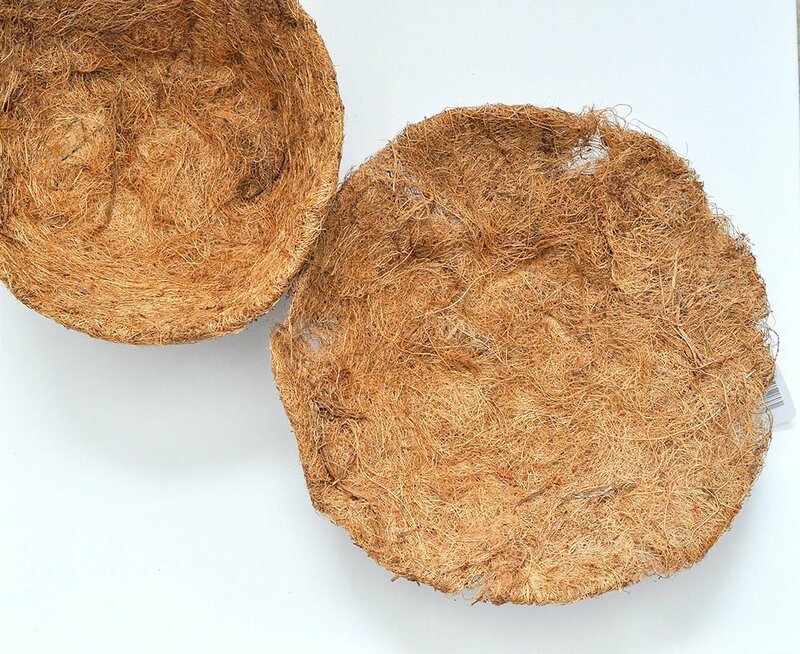 So smart to use coco plant liners. You have me thinking of all the things I can make with this now. Such a unique Easter craft! 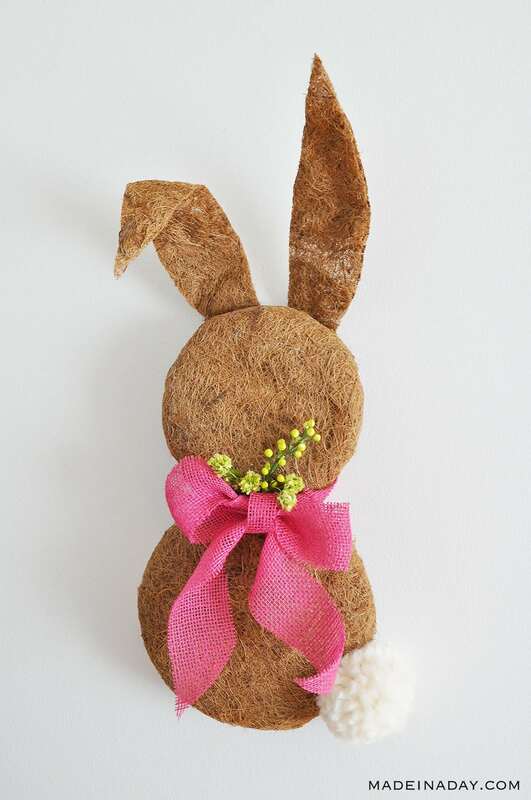 I know those moss covered crafts are so popular and I love them too but your coco liner bunny is awesome! I always enjoy blog hops because it’s the best place to find new ideas.